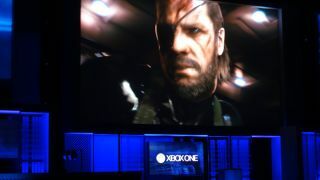 Microsoft opened its E3 2013 Xbox One press conference with a trailer for the highly anticipated Metal Gear Solid V.
The company was determined to keep its promise to focus on the games since the new console's initial announcement covered its TV, social and sports capabilities. The MGS V trailer showed off the game's new open world environment and graphics engine running on Xbox One. Microsoft President of Interactive Entertainment Business Don Mattrick and Kojima Studios Director Hideo Kojima then took the stage to talk briefly about the game. "This is an exciting day for our teams, and as we've been promising, it's all about the games," Mattrick said. After a brief break to talk about the Xbox 360, Microsoft Studios head Phil Spencer took the stage to finally introduce more Xbox One games. He said Microsoft is investing more in game development studios than ever before. He started by introducing a new franchise, Crytek's Roman action game Ryse: Son of Rome, which Microsoft has been teasing for years but looks brand new on the new console. Next came Killer Instinct, a next-gen title in the beloved fighting game series. Do you have killer instincts to play? Insomniac's Ted Price then stepped onstage to talk about Sunset Overdrive, a "stylized" third person shooter that the developer will be able to change on the fly, adding new content day by day. He said it's something that's only possible on Xbox One. Next up came Forza Motorsport 5, the next entry in Microsoft's realistic driving simulation series. Front and center on the stage was a gorgeous McLaren P1 car. A new feature for the series, called "drive-atar," allows the game to learn how to mimic human drivers so it never feels like you're racing AI. Microsoft's Phil Harrison then introduced the popular Minecraft for Xbox One with the claim "bigger worlds" displayed on screen. Quantum Break reappeared at this conference, having made its first appearance during the Xbox One's announcement event. For the first time we got to see some footage of the game, which appears to blend espionage and sci-fi. Microsoft then briefly teased a new game called D4 from Japanese developer Swery65 with a cel-shaded aesthetic. Microsoft Studios' Dave McCarthy stepped into the spotlight after that to introduce Project Spark, using voice commands to create a virtual environment and Xbox Smartglass - Microsoft's tablet tie-in application - to add details. He continued to add characters and enemies with unique behaviors, showing Project Spark as an advanced creation tool with multiplayer and social gameplay possibilities. He mentioned that Project Spark will be available for Windows 8 as well. After taking a quick break to discuss Twitch integration and new SmartGlass features, Microsoft had its first technical snafu of the day when it introduced a new title called Crimson Dragon. While the dragon-riding gameplay looked impressive, the sound on the video was unfortunately missing. Capcom's Dead Rising zombie-slaying franchise made an appearance with the world premiere of Dead Rising 3. Polish developer CD Projekt Red then took the stage to show off the first gameplay footage ever seen for The Witcher 3: Wild Hunt, which is confirmed as an Xbox One title. The latest installment is also the series' first open world game. Technical difficulty number two came when EA attempted to play a video showing off Battlefield 4, the newest Battlefield title from EA DICE. The video played after a short delay, showing off some intense first-person shooting gameplay on a rapidly sinking ship. They also revealed that the game's first map pack, "Second Assault," will arrive first on Xbox One. Microsoft's Spencer then returned to show off an artsy-looking, mysterious new Xbox One game called Below. The next few reveals raised more questions than they answered. Spencer retook the stage to explain that Microsoft is investing in five game studios to create new triple-A games. One unnamed title featuring a black-clad spy is in development at a Vancouver studio called Black Tusk. New triple-A title coming soon! Another is a new Halo game for Xbox One, though Microsoft pointedly did not refer to it as Halo 5. Finally Respawn Entertainment, a studio founded by former Call of Duty developers, appeared to show off the first gameplay footage from the mech-based first person shooter called Titanfall. This is just the beginning of E3 2013, so stay tuned for TechRadar as we cover the rest of the big announcements and take to the show floor throughout the week.